Summer is upon us and that means that festival season is in full swing. Food festivals are popping up across the United States offering travelers the opportunity to sample local delicacies and favorites in one location. 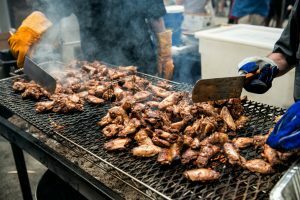 From amazing BBQ to favorite dessert dishes, these festivals have something to offer you and your traveling companions. Come listen to the top names in Bluegrass music at this annual festival. Each year award-winning groups and those who are rising through the genre come out to celebrate the best in Bluegrass and BBQ. Come hungry and be prepared to try the best of the best from Silver Dollar City’s barbecue restaurants. There is an opportunity to try small samples of your favorites through the day. If you have a big hankering for some great BBQ, you can take part in the All-You-Care-To-East Rib Feast that takes place starting at 3pm each day of the festival. You might be surprised to know that for the last 100+ years there has been a great debate about where the banana split was invented. It has, in fact, been a major debate in Ohio and Pennsylvania since the early 1900s when the original Hazard’s Restaurant in Wilmington, Ohio lay claim to being the first to serve the dish. In response to who may or may not own the title of originator, the residents of Wilmington decided that they would up the ante by creating an entire annual festival to celebrate one of America’s favorite dessert dishes. This family-friendly celebration of everyone’s favorite frozen dessert is held each year at the Fiesta Gardens near Festival Beach in Austin, Texas. Guests of the event delight in the large variety of ice cream offers brought to them by local favorites and national ice cream makers. The day-long celebration includes a variety of live music, contests for adults and children, and a plethora of kid’s activities. It is the perfect place for some summer family fun. Tickets for the festival run $15, which give the attendee three tickets to redeem with vendors of his or her choice. You might want to arrive early in the day as a number of booths do not require tickets and will hand out free samples until they are out of ice cream.